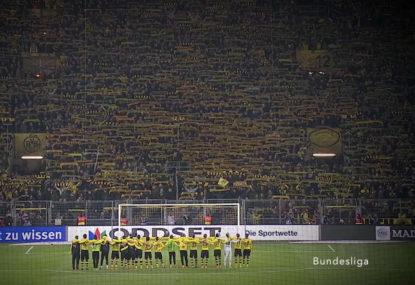 Dortmund's yellow wall, the most passionate corner of a stadium in world football. The best league in the world kicks off next weekend, and the great news for Aussies is that we can watch the whole thing live on TV. Alarm bells should be ringing in London over Optus’ apparent inability to adequately broadcast the English Premier League, with the ongoing avalanche of complaints on social media surely damaging reputations. But Australian fans frustrated by the Premier League’s poor picture quality, intermittent drop-outs and 60-second transmission delay needn’t worry. A league with bigger crowds, better grounds and arguably better players gets under way this week. The 54th season of the German Bundesliga kicks off this Saturday morning (AEST), with champions Bayern München hosting last season’s miracle survivors Werder Bremen in a match broadcast live on BeIN Sports at 4.30am. And before anyone suggests the Bundesliga is a one-horse race, it’s worth pointing out that Bremen – along with Borussia Dortmund, VfB Stuttgart and VfL Wolfsburg – are one of four other clubs to have won the Bundesliga since the turn of the century. Germany even had a Leicester City long before the Foxes stunned the football world, after Kaiserslautern lifted the Bundesliga trophy in 1998 just a year after being crowned second division champions. Bayern, of course, have dominated recent campaigns, winning the last four Bundesliga titles in a row – the past three of which came under the relentless attacking auspices of Pep Guardiola. Guardiola is obviously now at Manchester City, where he’ll be hoping to have considerably more luck than his erstwhile counterpart Jürgen Klopp is currently having trying to instil his gegenpressing system at Liverpool. Klopp led Borussia Dortmund to barnstorming back-to-back titles in 2010-11 and 2011-12, and with his protégé Thomas Tuchel now in charge of the club which boasts Europe’s highest average attendances, Dortmund will look to mount a significant title challenge this time around. They start with a fascinating first-up clash at home to Tuchel’s former club FSV Mainz in front of one of Europe’s most passionate crowds, with the game once again broadcast live on BeIN Sports at 11.30pm on Saturday night. It’s hard to describe just how much louder atmospheres are in Germany compared to the staid stadia of England, so your best bet is simply to tune in and experience it for yourself. It’s not like the noisy crowds are confined to the Bundesliga either. Those lucky enough to tune in last Saturday night would have witnessed the tradition-laden Dynamo Dresden – now in the second division – come from 2-0 down to defeat nouveau riche local rivals Leipzig on penalties in front of almost 30,000 fans at a sold-out DDV-Stadion in the first round of the German Cup. Sell-outs in the early rounds of the Cup are common, not least because the German FA lets the lower-ranked team host the tie. Only one thing has held the Bundesliga back from becoming the most popular league in the world – the English language. If it weren’t for English becoming the lingua franca across the globe, many more fans would have cottoned on to the fact that the Bundesliga is hands-down the most entertaining league in world football. That said, over the past couple of seasons German clubs and the Bundesliga itself have ramped up their English-language coverage, so much so that it’s now possible to follow everything in English on social media. Of course, it wasn’t all plain sailing for German football this weekend, with a young German side losing on penalties to host nation Brazil in a gripping Olympics final at the Maracana. The pressure on Neymar to win gold for his country was immense, so it was fitting to see the Brazilian skipper smash home the deciding penalty on the back of his stupendous first half free-kick. The Germans will carry on, as they always do, and attention now turns to the Bundesliga. By almost any measure it’s the most watchable league in the world – and best of all, you can now watch the whole season unfold live on Australian TV.